For generations, the dragonriders had dedicated their lives to fighting Thread, the dreaded spores that periodically rained from the sky to ravage the land. On the backs of their magnificent telepathic dragons they flew to flame the deadly stuff out of the air before it could reach the planet's surface. 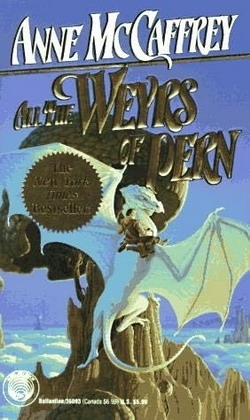 But the greatest dream of the dragon riders was to find a way to eradicate Thread completely, so that never again would their beloved Pern be threatened with destruction. Now, for the first time, it looked as if that dream could come true. For when the people of Pern, led by Masterharper Robinton and F'Lar and Lessa, Weyrleader and Weyrwoman of Benden Weyr, excavated the ancient remains of the planet's original settlement, they uncovered the colonist's voice-activated artificial intelligence system - which still functioned! And the computer had incredible news for them: There was a chance - a good chance - that they could, at long last, annihilate Thread once and for all!